by Prof Dr Dr Randolph Riemschneider, L.B.Fel. A chemist sees in THALIDOMIDE (plate 1) a substituted glutamic acid derivative, ie a molecule which is structurally related to the amino acids and might possibly be expected to have a positive or negative effect on the intermediary metabolism. The author details his own experiences with thalidomide in view of the tragedy, but also its "benefical" sides (- the editors). Almost every German who hears of thalidomide today immediately thinks of the calamitous affair in 1958-61, viz the birth of many deformed babies throughout the world after the sleeping pill thalidomide was taken during pregnancy. The other side of thalidomide is less well known: while it does not heal leprosy, it does contain this terrible disease. Thalidomide has proved itself as a weapon against malignant growths and has been used under strict conditions for some years, eg in the USA, in tumour therapy (breast cancer, brain tumours). Growth-inhibition experiments on ascites in mice in our institute in 1963, using thalidomide prepared in our laboratory, provided the first indication of its action on malignant cells (3). In the mid-60s, Prof Dr H Gerhartz noted that it inhibited the formation of new blood vessels (angiogenesis) (6), as is desirable in the case of growing tumour tissue. In a number of cases during six years of co-operation with Prof Dr H Gerhartz of the Klinikum Westend, FU Berlin (5) and another 12 years with Prof Dr José Mariano da Rocha Filho, director of UFSM university clinic and rector of UFSM [1974-84] (2), positive results in cancer therapy were obtained in the clinics named with the preparation of thalidomide manufactured in the Institute of Biochemistry at the FU Berlin. Unfortunately, political developments at the time at the FU Berlin (1968 student revolution) as well as the change of government in Brazil (from a dictatorship to democracy) prevented these important investigations from being expanded. The change in the rectorate was a factor as was the fact that the author was no longer able to travel regularly to Brazil for a few months every year, like in 1963-77, as his main task of organizing the Central Institute of Chemistry with all chemical departments was accomplished in 1973. The author took an interest in this molecule immediately after thalidomide came onto the market as a sedative in West Germany in October 1957, more precisely in the question: "What is to be expected from this unphysiological ‘amino acid derivative’?" and especially after the thalidomide affair, as is evident from the lectures in 1962 and thereafter (7, 8, 5, 4). From 1958, we incorporated thalidomide experiments into four of our on-going projects. As the firm CHEMIE-Grünenthal did not make the thalidomide that we had requested (Nov 57) available for insecticide experiments, we synthesized it ourselves, using various methods (9, 16), and developed a useful manufacturing process (11). To PROJECT 1: Description of I-syntheses and of synthesis of I-analogues (12, 8, 17, 11). No differences in action were observed in the case of I-stereoisomers (8, 11, 9, 8). 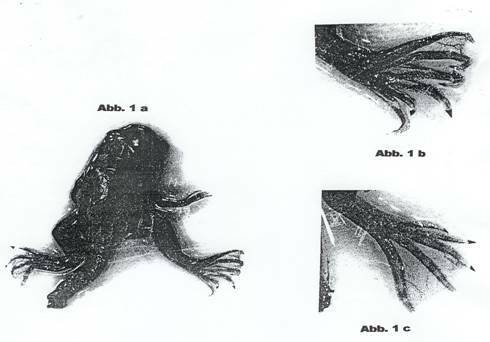 To PROJECT 3: Deformities were observed in some cases during experiments to inhibit the growth of Xenopus laevis DAUDIN tadpoles (14, 17): Photos: Abb. 1a and 1b. Growth of ascitic cells in mice inhibited, ie growth inhibition of malignant cells (3). As mentioned above, according to H Gerhartz [private communication (6)], thalidomide inhibits the formation of new blood vessels (angiogenesis), as is desirable in the case of growing tumours: tumour therapy. Initially six years of experiments in the Klinikum Westend (H Gerhartz) These photos were made public, among other places, during a lecture given by the author at the Fiera di Verona in 1983 (cf Ref 17). These photos were sent to the managers of the firm Chemie-Grünenthal on 01 June 1959, with a request to support research by a doctoral candidate. To PROJECT 4: Expanding on the tadpole experiments in 3), and subsequent to Dr Lenz’s lecture (18 Nov 61), gravid rabbits were treated with thalidomide: Observation of the birth of deformed newborn within a few weeks: February till April 1962, published in (15a-d). The introductory lectures in Brazil in 1962-70 (7, 8) roused considerable interest in thalidomide at the UFSM. On the basis of the positive results obtained in the lab tests with mouse ascites (3) and in Berlin’s Klinikum Westend, an agreement was reached to co-operate with Prof Dr J Mariano da Rocha Filho, the university rector and chief physician of the university clinic, to treat the tumours of cancer patients with thalidomide, under certain conditions. 110 patients were treated in 1972-84, including 41 cases of plasmocytoma or myeloma (2). To counter any possible teratogenicity of thalidomide, the following conditions were imposed: Female patients of child-bearing age had to undergo regular pregnancy tests and use two types of contraceptive and the men had to sign up to use contraceptives. Prescribing thalidomide was linked to a compulsory information and supervision programme. Some details of the myeloma investigations carried out in Brazil are below. It was planned to continue clinical treatment with thalidomide, but unfortunately this was not possible due to the change of government and staff, as noted above. Moreover, the author was no longer able to travel regularly to Brazil after 1977. Our communication of 12 Oct 82 to Chemie-Grünenthal remained unanswered. From the medical reports and treatment protocols of cancer patients in Brazil (treated 1972-84) on the anti-tumour activity of thalidomide (I) in Refractory Multiple Melanoma: as per handwritten excerpts of the attending physicians, supervised by Prof Dr José Mariano da Rocha Filho of UFSM, Santa Maria, RS, Brazil. Total treatment and observation time from commencement of treatment: up to 52 weeks: "On refractory-myelome-patients (partially previously treated) applied oral I within 12 weaks, starting with 250 mg/day for 3 weeks, then with 200 mg/day for further 3 weeks and later with 150 mg/day until the end. Paraprotein-control experiments: Analysis of Myeloma protein in serum (A), and Bence-Jones protein in urin (sic) (B), Plasma cells number in bone marrow (C). Results of A, B and C: Reduction in 48% of cases." Australia’s Therapeutic Goods Administration (TGA) in Melbourne, reputedly imposed similar conditions as recommended by the Australian Drug Evaluation Committee for administering thalidomide in cancer (and leprosy) therapy on the pharmaceutical company PHARMION. Lectures, reports, manuscripts, publications by author, J M da Rocha Filho, H Gerhartz inter alia. Lecture, given in English at the colloquium of WIDMER AG, Wädenswil, Switzerland on 15 July 79 on the occasion of the takeover of the company by ELBIO Co, later BIODELL Co Ltd, Lugano, Switzerland (scientific manager from 1979: author). During the lecture, a detailed report was presented on the results of clinical trials with thalidomide for treating of tumours, conducted in the Klinikum Westend at the FU Berlin in 1968-74 and in the university clinic of the UFSM in Brazil (2). From the clinic of the UFSM, Brazil and the Institute of Biochemistry at the FU Berlin. Purest thalidomide was prepared as previously and delivered by Riemschneider and K Nolde, P Reichert, R Wasicky, S Souza, R Bethke, H-J Hein (9, 11). The patients were subjected to certain conditions on account of the teratogenicity of thalidomide. All of the clinical protocols are in the secretariat of Prof J Mariano da Rocha Filho. We refrained from publishing them at the time due to the small number of cancer patients treated and reasons of patent law. Further applications of thalidomide in cancer therapy were planned but, unfortunately, not carried out (change of government and staff). With the assent of Prof Dr Gerhartz, Prof Dr J Mariano da Rocha Filho and the author wrote a confidential letter to Chemie Grünenthal, the manufacturers of thalidomide, briefly informing them that there were interesting clinical reports on the treatment of cancer patients with thalidomide. Lab report Jan 64, 11 p, secreted at request of Prof Dr S Takei, University of Kyoto, Japan. Djunko Takei is the daughter of the aforementioned professor. It was intended that she continue this direction of work with other test objects on her return to Japan. Ms Takei collaborated with the author in the Berlin institute for 4 years and returned to Japan at the end of 1964, but only for a short while as she had married Peter Nowack in Germany. - These trials were continued in Germany and Brazil in collaboration with the Klinikum Westend, FU Berlin [1968-74 (2)] and later with the university clinic at UFSM, Santa Maria, RS [1972-84]: Treatment of cancer patients with thalidomide (2, 5). Lecture, given to Scientific Colloquium of Central Institute of Biochemistry and Biophysics at FU Berlin in Oct 74 in lecture hall of institute building V, Ostpreußendamm 111, Lichterfelde-Süd. For the reasons given above, it was – with one exception (5) – impossible for us to research more exactly into what else the thalidomide molecule was good for and whether it was possible to develop a sedative on the basis of a thalidomide analogue, without teratogenic side effects. We were, however, in collaboration with Prof Dr José Mariano da Rocha Filho, director of the university clinic of the UFSM, Santa Maria, Rio Grande do Sul, Brazil and Prof Dr J Joachimovicz, Pharmacology, UFSM, able to successfully continue the research to clarify some of the above points for 12 years (2, 5). Report: Clinical results* when treating cancer patients with thalidomide in 1968-74 (Klinische Ergebnisse bei der Behandlung von Krebspatienten mit Contergan in den Jahren 1968 – 1974): 14 positive cases from ward Vb, oncology in the Klinikum Westend, and Institute of Biochemistry, both at FU Berlin. Purest thalidomide prepared in the Institute of Biochemistry. Special precautions for adminstering thalidomide laid down by Klinikum Westend. Protocols of medical reports kept in Prof Dr H Gerhartz’s secretariat. Results: Positive results in 14 cases of patients with breast cancer. Publication was postponed at the time, initially for reasons of patent law, but also due to the "critical situation" at the Free University of Berlin. The trials were kept as secret as possible on account of the "radical" students. It must be emphasized that they were not commissioned by industry, but were solely a private inintiative by the two aforementioned befriended professors. Personal communication: Thalidomide, prepared in Institute of Biochemistry at FU, inhibits growth of new blood vessels (angiogenesis), observations 1965-66. (Contergan, hergestellt im Institut für Biochemie der FU, hemmt die Bildung neuer Blutgefäße (Angiogenese), Beobachtungen aus dem Jahre 1965/66). "About teratogen action of organic compounds", Bull II: "On modification of thalidomide molecule (I) to find analogues without teratogenic side effects and test what else the I-molecule can do" (Über die teratogene Wirkung organischer Verbindungen", Mitt. II: „Zur Abwandlung des Contergan (Thalidomid)-Moleküls (I), um Analoge ohne teratogene Nebenwirkungen zu finden und um zu testen, was das I-Molekül noch kann): Lecture in English at Universidade Federal de Sao Paulo, Brazil on 11 Sept 62 (Chair: Prof Dr R Wasicky, Biochemistry and Pharmacy). Manuscript July 62, 25 pages, 5 plates and 25 formulas, hectographed 1963 in university press of UFSM, Brazil, 50 copies distributed. Lectures in Central Chemical Institute of UFSM, Brazil in Oct 70 and 74 – after investigations at Free University of Berlin 1958-64, continued in the meanwhile established Central Chemical Institute of UFSM, Brazil. Experiments in the thalidomide project were interrupted and prevented for years by the university reform (so-called democratization of Free University of Berlin) 1969, as noted above, with the exception of (5). We were interested in transforming the highly interesting thalidomide molecule, firstly to find 1-analogues without teratogenic side effects and also to see what else the 1-molecule can do: The search for other effects of thalidomide and its analogues. According to the relevant literature, thalidomide has meantime been successfully used against forms of the infectious disease leprosy Erythema nodosum leposum [ENL]. * However, the leprous women treated with it were insufficiently informed about its teratogenic effect – the thalidomide affair was repeated for some of the lepers! from the Department of Biochemistry at the Free University of Berlin, Königin-Luise-Str 2-4, Berlin-Dahlem. 4 as preliminary tests for synthesizing optically active thalidomides (11). manuscript Jan 58, 8 pages, cf also Plate 2.
manuscript and laboratory reports from 1960-61 in Portuguese (50 copies, hectographed) following serial tests in the forerunner of the Central Chemical Institute of the Santa Maria Federal University (UFSM) in Brazil and the Department of Biochemistry at the Free University of Berlin (FU); cf also (7, 16). 2 laboratory reports Dec 58 and Jan 59, total 19 p. Deformaties were observed in 2 cases. Photos: Abb. 1a, 1b, 1c. Laboratory reports May 62 – Basis for the tests described here (15), conducted from Dec 61 to May 62 in the rabbit breeding facility purchased by the Institute of Biochemistry at FU Berlin from Mr Carl Lange of Hamburg-Neuhof in collaboration with Drs med K Brockmeyer and H Sommer as well as Mr Carl Lange (inasfar as his health permitted) and two students from the University of Hamburg. Results: First indications of the teratogenic effects of thalidomide on mammals (test animals). The editors of the journal "Arzneimittelforschung" declined publication in June 62; the jounal "Zeitschrift für Naturforschung" also only published these results after an initial delay, following intervention by the Nobel prize winner Prof Dr A Butenandt: (15a). Lecture 1: "Proof of the teratogenic effect of thalidomide in rabbit tests" (Nachweis der teratogenen Wirkung des Contergans (Thalidomid) im Kaninchenversuch ) with 20 slides of deformaties in foetuses, given in German to the "Medical Association" (Sociedad de Obstetricia y Ginecologia de Buenos Aires y Sociedad Argentina para el Estudio de la Esterilidad) in Buenos Aires, Argentina on 04 Sep 62 and simultaneously translated into Spanish, extracts published in (15a). The trip to Argentina and Brazil had been planned far in advance of May 62 for other reasons. It came to the lecture to the said association because there had already been 5 000 thalidomide cases by Aug 62. When I told a friend of our results, he arranged a date at short notice. Lecture II given on 11 Sep 62, otherwise as above (15c). After lectures I and II, the following questions were addressed: Which positive aspects can be wrested from the thalidomide molecule? Transformations of the molecule, other applications? Manuscript Jan 63 and 4 lectures: In Sao Paulo (Oct 61 , Berlin (Jan 63), S Maria (Apr 63) [and Verona (1983)]. Ten illustrations of deformaties in thirty pages of manuscript from the Institute of Biochemistry at the Free University of Berlin and the Pharmacological Institute at UFSM, Brazil. Some of the illustrations were published in conjunction with a lecture given at the "Fiera dell’Agricultura" in Verona, Italy on 20 Mar 83, eg Photos: Abb. 1a-c. These investigations are the continuation of the experiments from 1958-59 (14, 18) in which the inhibition of metamorphis in Xenopus laevis DAUDIN tadpoles had already been observed. Further investigations in this direction together with Dr W Trost and Dipl Biol R Roetz. "Inhibition of growth in Xenopus laevis DAUDIN tadpoles and delay in their metamorphosis by 9 - 12 days under the influence of thalidomide" (Hemmung des Wachstums der Kaulquappen von Xenopus laevis DAUDIN und Verzögerung ihrer Metamorphose um 9 – 12 Tage unter Contergan-Einfluß) lecture II of Oct 61 and manuscript May 59, 10 pages: Teratogenic effects were observed in some cases on frogs photographed at the end of metamorphosis: analogous to photos: Abb. 1a-c. As we had no experience in the fields of embryopathy and teratogenicity, these observations were not accorded the significance they deserved. But despite their negative attitude, we sent this information with photos (Abb.1) to Chemie-Grünenthal, the manufacturers of thalidomide, in Jun 59 (14) requesting funds for a doctoral candidate. Unfortunately, no answer was forthcoming at the time. Continuation of experiments: (17). * The author actually considered conducting further experiments with test animals before using in the clinic. However, Prof Gerhartz pointed out that this required special approval and would lose a lot of time. It would be easier to begin directly with clinical trials, particularly as Contergan [Softenon in Switzerland] had been licensed as a sedative years back. * Licensed in USA since 1997 (FDA) but only under strict conditions. In 1964, an Israeli doctor had discovered that thalidomide is effective against a painful skin inflammation which occurs in leprosy patients. We know now that leprosy can also be successfully treated with Prednisolon and Clofazimin, thus avoiding the danger of deformed children: WHO recommendation in 2003.